Proving that Denial isn’t just a river in Egypt, only 25% of pre-retirees are considering postponing their retirement age despite being woefully underprepared financially for retirement. Although consumers have taken some … steps, these could be masking a deeper failure to understand the state of retirement security. McKinsey?s retirement readiness index (RRI)?which uses Social Security, defined benefits, defined contributions, and other financial assets to measure the financial preparedness of households for retirement?is currently at 63 for an average household in January 2009. Consumers must have an RRI of 100 to maintain their current standard of living at retirement. An RRI below 80 calls for large reductions in spending on basic needs, such as housing, food, and health care. 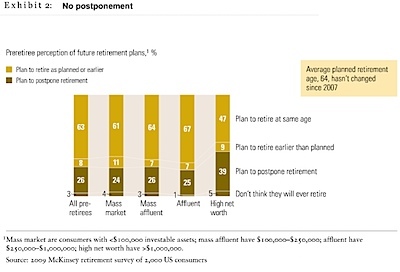 Yet our survey showed that only about a quarter of US consumers are considering postponing retirement as a result of the crisis: the expected retirement age, 64, hasn?t changed since 2007 (Exhibit 2). Despite the fall in home values, the proportion of people planning to finance their retirement through home equity has increased slightly. 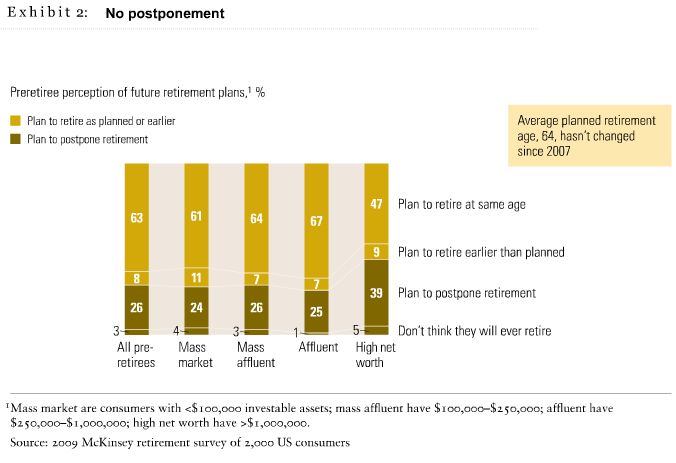 What is the prevailing attitude and what did these pre-retirees do about it? 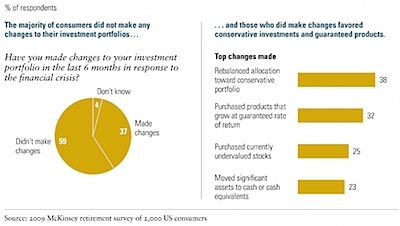 …in the past six months, only 1 percent have moved assets away from their primary financial institution, just 37 percent have changed their investment portfolios, and no more than 20 percent have changed their retirement portfolios. 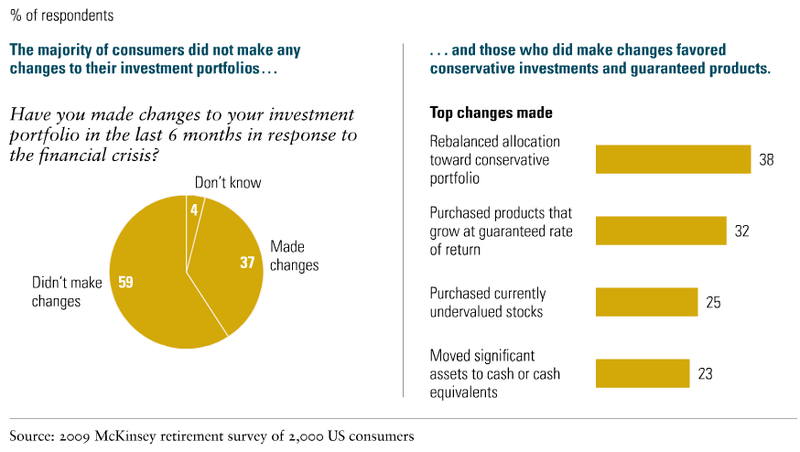 Those who did make changes have tried to reduce their risk levels by rebalancing allocations toward conservative assets (38 percent), products with guaranteed rates of return (32 percent), and holdings of cash and cash equivalents (23 percent) (Exhibit 1). Most preretirees have also responded to the financial crisis by curbing their lifestyles: some 60 percent reduced spending in the six months leading up to January 2009, and 73 percent paid down debt. …just 1 percent of preretirees hold their individual advisers primarily responsible for the impact of the crisis on them, compared with 43 percent who blame the government and regulators, and 27 percent who blame financial institutions. I wonder who or what the other 30% blame? John Hussman has another great weekly letter this week, with many salient points. Read the whole thing and you won’t be disappointed. Last week, financial stocks enjoyed a powerful advance and short squeeze on the announcement of the results of the ?stress test? of major banks. It is important to begin by noting that this was not a regulatory procedure with teeth. It was initially a response to Congressional demands to introduce greater objectivity into the use of public capital for these bailouts, and gradually morphed into nothing more than a ?confidence building? exercise. And keeping with the emphasis on keeping the numbers happy, as opposed to providing full and fair disclosure, the Wall Street Journal reported on Saturday, ?The Federal Reserve significantly scaled back the size of the capital hole facing some of the nation’s biggest banks shortly before concluding its stress tests, following two weeks of intense bargaining. In addition, according to bank and government officials, the Fed used a different measurement of bank-capital levels than analysts and investors had been expecting, resulting in much smaller capital deficits.? …Of course, Citi’s entire market cap is only $22 billion, so the ?$5.5 billion? that Citi is reported to need under the stress test is what it would require after a 5-to-1 dilution in its common stock (87+22/22). Essentially, we’ve got a company with a common equity buffer of just over 1% of total assets, that just 8 weeks ago was on the verge of receivership, and investors are urged to believe that there are enough voodoo dolls in the vault to make the company solvent even in a further weakened economy. Great. Then no more government money should be needed. Outstanding. Not a dime more of public funds beyond what remains in the TARP. No need to use public money to buy toxic assets either. I for one heartily agree. In a small town on the South Coast of France, the holiday season is in full swing, but it is raining so there is not too much business taking place. The prostitute quickly goes to the hotel, as she was owing the hotel for her hourly room used to entertain clients. At that moment, the rich Russian comes down to reception and informs the hotel owner that the room is unsatisfactory and takes his E100 back and departs. There was no profit or income. But everyone no longer has any debt and the small town?s people look optimistically towards their future. I was reminded of the posting when I read the following conclusion from Jeremy Grantham’s latest quarterly letter. Let me [emphasize] once again the difference between real wealth and the real economy on one hand, and illusionary wealth and debt on the other. If we had let all the reckless bankers go out of business, we would not have blown up our houses or our factories, or carted off our machine tools to Russia, nor would we have machine gunned any of our educated workforce, even our bankers! When the smoke had cleared, those with money would have bought up the bankrupt assets at cents on the dollar and we would have had a sharp recovery in the economy. 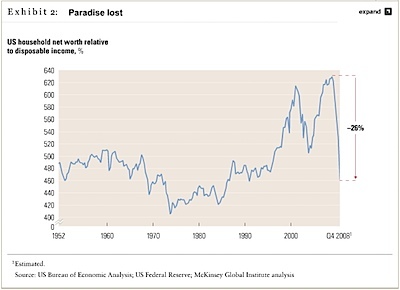 Moral hazard would have been crushed, lessons learned for a generation or two, and assets would be in stronger, more ef? cient hands. Debt is accounting, not reality. Real economies are much more resilient than they are given credit for. We allow ourselves to be terri? ed by the “?nancial-industrial complex” as Eisenhower might have said, much to their advantage. At the end of the day, the amount of debt destruction or deleveraging in the economy doesn’t change the underlying assets surrounding us. (Note that Grantham is talking about this in the aggregate, for the entire economy and country.) Illusions of wealth disappear, and ownership of those real assets often change hands… a fact that the “financial-industrial complex” is well aware of, and takes advantage of. Today is the second time that I’ve found out one of my financial institutions is going out of business, from blogger Mike Shedlock (Mish). Today’s casualty? Small business credit card provider Advanta. Too bad, they were innovative with their IdeaBlob sponsorship as well as support for Kiva. Unfortunately, when people aren’t paying their bills it is hard to be a credit card lender. Something dramatic has happened to the world?s birthrates. Defying predictions of demographic decline, northern Europeans have started having more babies. Britain and France are now projecting steady population growth through the middle of the century. In North America, the trends are similar. In 2050, according to United Nations projections, it is possible that nearly as many babies will be born in the United States as in China. Indeed, the population of the world?s current demographic colossus will be shrinking. And China is but one particularly sharp example of a widespread fall in birthrates that is occurring across most of the developing world, including much of Asia, Latin America, and the Middle East. …The decline of Muslim birthrates is a global phenomenon. …recent UN data suggest that Arab birthrates are falling fast, and that the number of births among women under the age of 20 is dropping even more sharply. The falling fertility rates in large segments of the Islamic world have been matched by another significant shift: Across northern and western Europe, women have suddenly started having more babies. …In 2007, France?s national statistical authority announced that the country had overtaken Ireland to boast the highest birthrate in Europe. In France, the fertility rate has risen from 1.7 in 1993 to 2.1 in 2007, its highest level since before 1980, despite a steady fall in birthrates among women not born in France. France?s National Institute of Demographic Studies reports that the immigrant population is responsible for only five percent of the rise in the ?birthrate. …A similar upturn is under way in the United States, where the fertility rate has climbed to its highest level since 1971, reaching 2.1 in 2006, according to the National Center for Health Statistics. New projections by the Pew Research Center suggest that if current trends continue, the population of the United States will rise from today?s total of some 300 million to 438 million in 2050. ?Eighty-?two percent of that increase will be produced by new immigrants and their U.S.-born descendants. …Russia… within little more than a decade the ?working-?age population will be shrinking by up to one million people annually. Russia is suffering a demographic decline on a scale that is normally associated with the effects of a major ?war. I recently watched Eric Rosenfeld’s lecture to MIT students about LTCM and what really happened. Rosenfeld was a partner at LTCM, so he definitely had the inside scoop. Academics ultimately view of the markets in a fundamentally wrong way — at least as Mr. Rosenfeld explains it. Here’s one of the biggest problem Mr. Rosenfeld doesn’t understand. Risk is not the same thing as price fluctuations (or the standard deviation of price fluctuations). In the presentation Rosenfeld makes several comments about how low the risk was in LTCM’s portfolio, for which the evidence was the low daily and monthly standard deviations of the portfolio. Obviously they didn’t understand the actual risk present in their trades is not the same thing as the price fluctuations. Someone was referring to Rosenfeld’s guest lecture as an attempt at revisionist history, but in reality I think he still misses this fundamental reality of risk. Let’s imagine that we have a stick of dynamite. It has a long fuse that takes 30 seconds to burn through. Suppose I put on a trade where I hold the dynamite for 20 seconds in exchange for some premium… tossing it into the distance after the 20 seconds. So, you tell me… if I take that trade and hold a stick of dynamite for 20 seconds, have I really participated in a trade that has very, very small risk? Does this argument sound familiar? It should, it’s the crux behind The Black Swan, where Nassim Taleb makes a very similar point. At the end of the day, any time you use leverage you are taking on the risk of failure. Not just of you, but also for your creditor. Take on ridiculous leverage, and you almost guarantee you will bust at some point in time. You guarantee that if/when a crisis hits, you will be one of the weak hands that liquidates. And you will liquidate not based on your own judgement, but rather on someone else’s judgement (the margin clerk’s). It is difficult enough to trade a multi-billion dollar hedge fund due to liquidity of the funds you invest in… how much more risky is it when you can’t close a position because your leverage makes you a much larger portion of the market you are trading in? Want a little refresher on what LTCM actually did do? Check the following 6 minute video for a little hyperbole…. 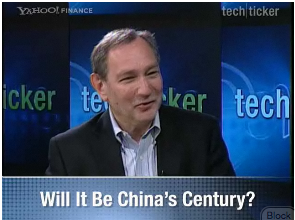 I recently read George Friedman’s The Next 100 Years , and was quite impressed by the book… the author recently went on Tech Ticker, and linked below is a segment of his interview where he talks about the challenges China faces and why it won’t be the super-power that everyone else seems to expect. Good stuff, and definitely food for thought. 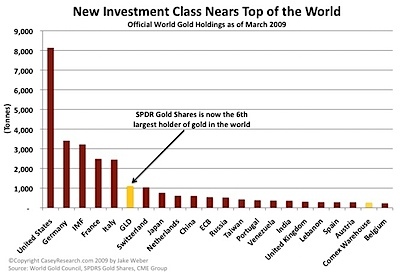 SPDR Gold Shares (GLD), an exchange-traded fund, first hit the market in November 2004 with 260,000 ounces of gold. Today, GLD is the world?s 6th largest holder of physical gold with over 35 million troy ounces in the vault. 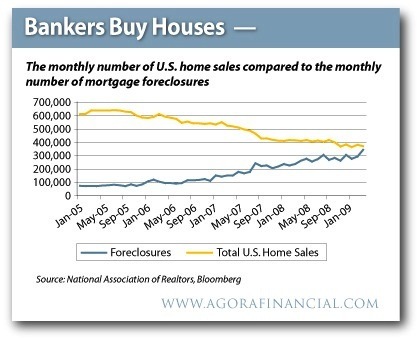 This is a little scary to see the number of sales and number of foreclosures on the same axis… and to see how close the numbers are to each other. 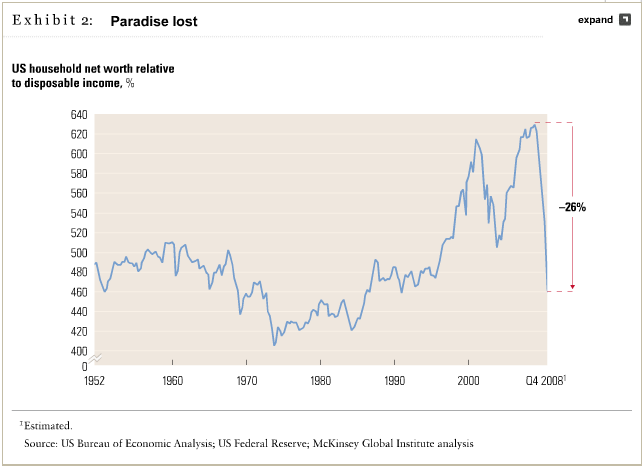 From McKensey, and interesting look at household net worth relative to disposable income. So far the net worth has fallen a good deal more than in the 2001 bear market… the result being a decrease in consumption and an increased savings rate to make up for the losses. Implicit in the chart is the fact that household net worths, in aggregate, fell about 160% of annualized disposable income. That means consumers would need to save every possible (discretionary) penny for the next year and a half to get back to the recent high.